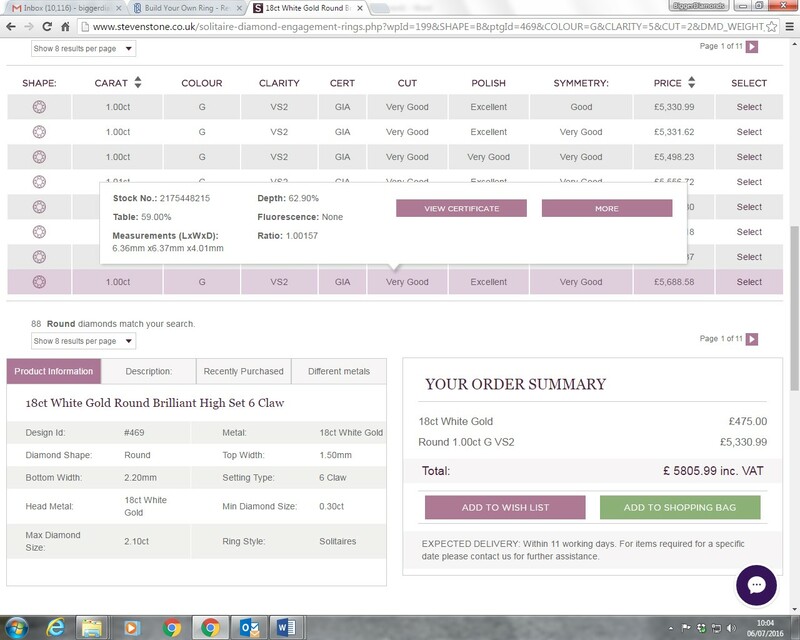 Buying an expensive engagement ring on-line is nothing less than a minefield. Can the seller be relied upon? Will the diamond be as good as claimed? What about the quality of the setting? 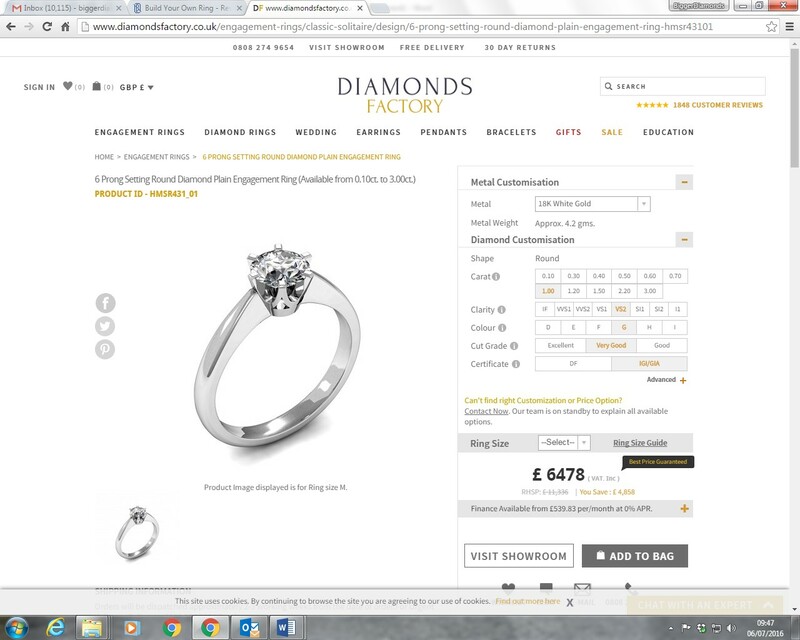 Do online engagement ring sellers cut corners? These are all questions any buyer will have concerns about. Research shows, the following companies appear to offer the best value and quality to UK buyers. The rings compared are ‘like for like’ and all supply independent certificates so buyers know they are getting what they pay for. Feedback from previous customers on independent review sites are first class. Biggerdiamonds4less have been established since 2011, so are a relatively new player, but appear to be the fastest growing diamond retailer currently on the internet. Interestingly, they offer a 4-5 day delivery on most of their rings which is quite a lot quicker than the competition, suggesting they hold considerable stock. Based in Greville Street, Hatton Garden, this company has the advantage of a physical showroom enabling visitors to ‘view before buying’. Their website states the showroom is usually trade only, but public are welcome if they make an appointment. A 14 day money back guarantee means internet shoppers can buy with confidence. Videos of their designs both on and off the hand are a nice touch. They score 9.6 and are rated ‘Excellent’ by independent review site TrustPilot. 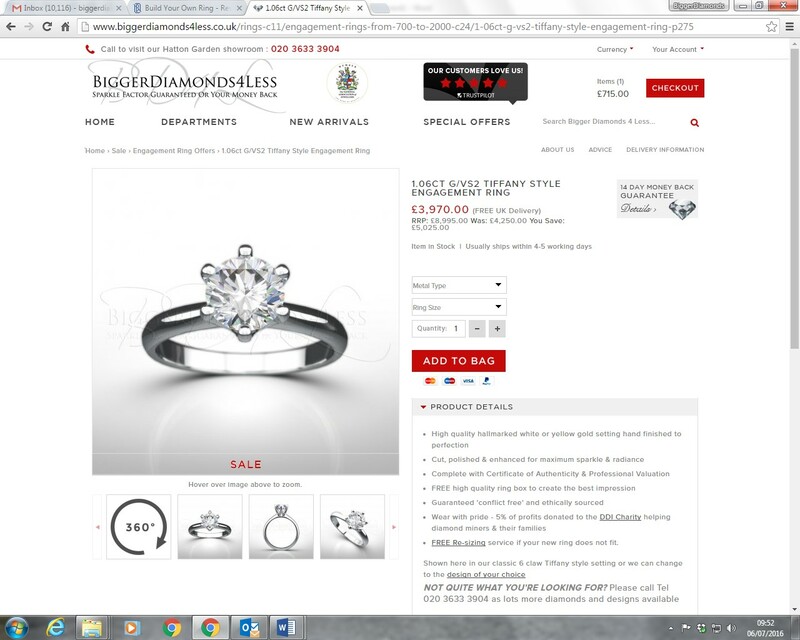 77Diamonds are a well established online company and again offer a showroom to visitors in Mayfair, London. They are an independent retailer with excellent customer service reputation and an easy to use ring builder giving buyers the choice to select different styles of ring and quality of diamonds. Delivery is usually 2-3 weeks and not all the diamonds listed are available to view if you visit their showroom, as they list stocks available from overseas merchants hence the slightly longer lead time. A 30 day returns policy is operated. Independent review site Feefo scores them an impressive 98% and ‘Excellent’ service rating. 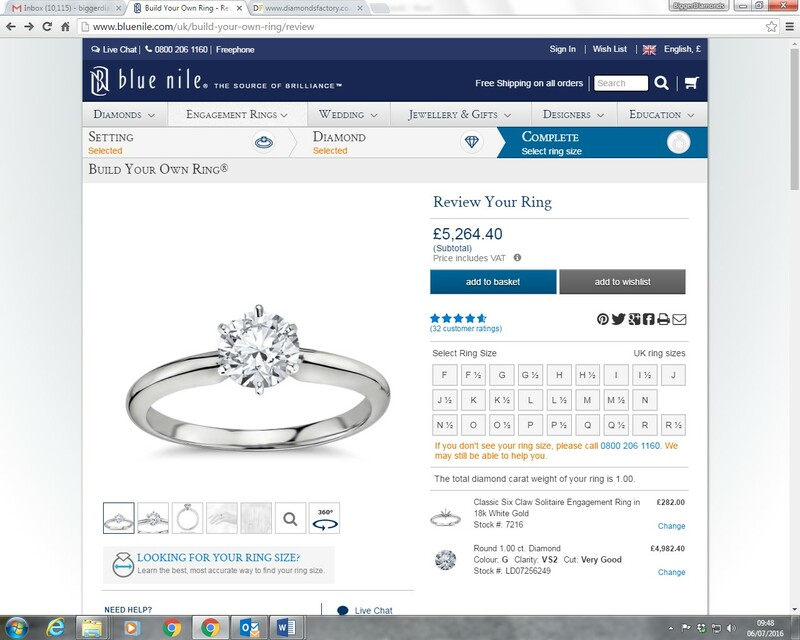 Bluenile are a global company and the biggest online retailer of diamond jewellery with a turnover approaching $90m dollars. They have a website dedicated to the UK and delivery is typically 2-3 weeks as again, like most online specialists, they don’t actually hold stock and simply list on their site the inventory of their merchants. Customers can buy with confidence as this is a public company listed on the US stock exchange Nasdaq, but they do not have a showroom and rely on being a totally e-commerce organisation. Operating a 30 days return policy, they have a 95% customer satisfaction rating on Bizrate who class their service as ‘outstanding’. Originally family jewellers established well before the Internet in 1937, they now have shops you in London, Manchester and even Palm Beach! They sell exclusively GIA certified diamonds, so will never be the cheapest and like the others above, a wide range of engagement ring designs are available. A 14 days return policy is in operation. Simple to use ring builder and easy to navigate site. 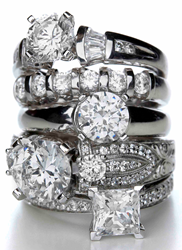 A good choice for those who want to buy thei engagement ring from a traditional 'bricks & mortar' retailer. These guys are rated ‘Excellent’ and enjoy a 100% product rating on independent review site Feefo. The fifth generation of what was originally a banking family in Asia, embraced technology to establish their jewellery business online. Customers may visit their showroom in Hatton Garden or internet buyers enjoy the benefit of their 30 days returns policy. 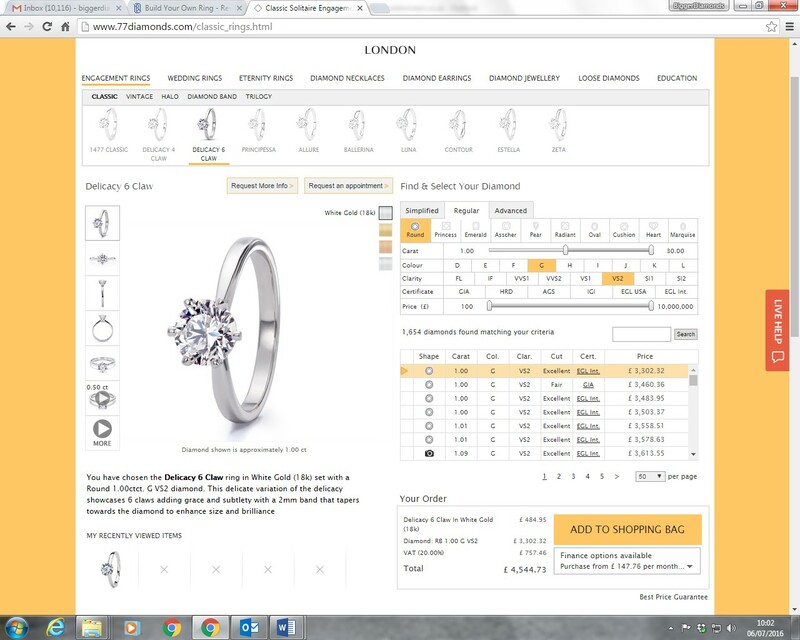 Their website is exceedingly easy to navigate and the animated videos show engagement ring designs from all angles. They enjoy excellent reviews on independent website TrustPilot achieving a 97% rating and ‘excellent’ customer service. In summary, any of the above companies are likely to provide you with an outstanding engagement ring. Buying from a trustworthy online company will save you fortunes as high street retailers need to charge more to cover their overheads. Good luck finding the engagement ring of your dreams!